U gots sammin? Ai juss gots toonaz. Dats wye awl teh boalz. Did ai doo sumtihng ?? Best tu say nuthing !! * wheels in teh buffay wif sordid hawt oar cawld meetz adn fisheez. Mmmmm, ai will has sum meets, adn fisheez, adn krab-cayks … Fankeez wrr! Comgrabyurelayshuns awn yuur nawt-sekkund, AP!! Wih can has shampers wif stromberreez, adn cheezecaek uv awl sordid kyndz foar noms adn sillybrayshuns, mebbe??? Hu ar yu dis tiem? Lemme se naow. finkso ai haz a full dress sumwairz ina closit. problee nawt zippitup enny moar. *tee-hee* papa wayrz tuu dressiz in dis wun. 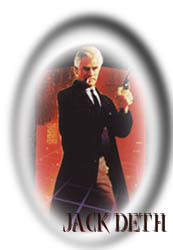 Hims mayn karaktur is Billy, Holmzez assistint, hoo dressez azza huuker at teh pre-show fyte seen tu loor in Jakk teh Ripper, adn at teh end wen Holmz disgyzes hizzelf as teh noo butler, as hims dottur. Hims is awlso teh fiansee ob teh deseesd at teh inkwest at teh beginnin, so hims endz up wayrin foar kostoomz … tuu menz adn tuu wimminz! Wi can haz smorgasbord ?? o.O, wy duz ai hav such a ful playte ?? Nebber no whut ffork tu uze!! 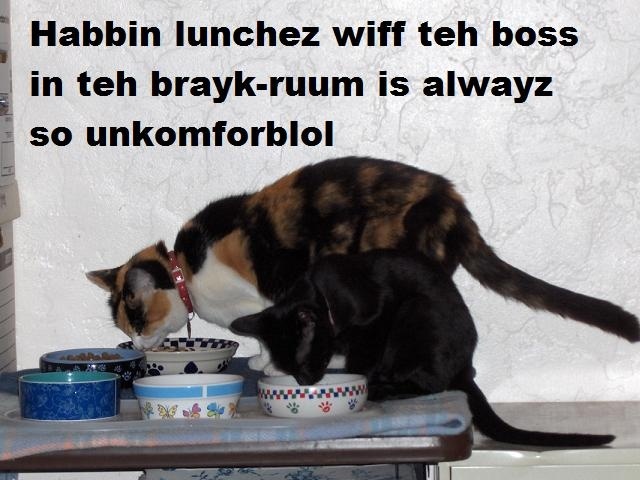 Wai, noe foark a’tall … affuturr awl, kittehs gawtz noe fumbs!! Wanna trayde? Ai’ll gib yu tuu bytes uv mai draifud faor wun byte uv yuur gushifud. Akshully, papa had a hard tyme gettin us tu eet teh ryte fudz. Teh kittinz kept wantin myne, adn aifawt teh kittin-fudz wuz betterer! i haz to be on my bestest mannurs.